Copper/Aluminum Radiators consist of clean automotive radiators, where all plastic, iron and foreign attachments have been removed. Copper/Aluminum radiators are found in cars, trucks, and vehicles and have a high scrap metal value due to their copper and aluminum materials. Best value when cleaned by removing all steel and plastic attachments. 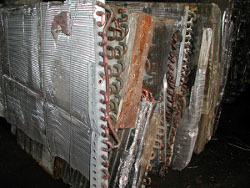 Cu/Al Radiators are considered to be a valuable scrap material and can be sold to scrap yards and dealers at high prices, usually by the pound.